As we started sharing content on early Convofy builds, we also started to discover the hidden interests and expertise that already existed within our team. Looking at the shared links, pictures and news stories, we discovered the photographers, the movie buffs, the mountaineers. This was valuable insight that we wanted to showcase in the product too. Every time you share something on your Convofy network, you also share underlying metadata – author, time, who has access etc. Convofy puts this metadata to good use and exposes insights about your team within your network. The size of the presence bubble next to each contact represents their contributions to your network. The more you share and collaborate the bigger your bubble. This kind of transparency is great for uncovering the top players within your organization. 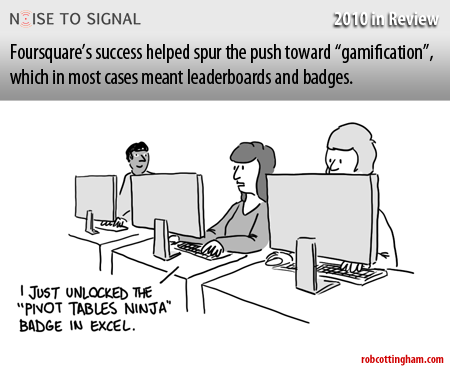 Of course a little healthy rivalry is part of the gamification package. We have had terms like “over-sharer” and “spammer” thrown around and some team members have proposed new algorithms that are designed to tilt the scales in their favor. We have also invented several conspiracy theories including one that accuses the top contributors of creating private groups and sharing junk content just to build their score. This is obviously not true. Your contact list learns from your interactions and is ordered by relevance. Right at the top of your contact list are the people you are most likely to ping, those that you interact with most often. Want to ping someone you haven’t talked to in a while? Just type in their name in the find box at the top of the list. The group list is just as smart. Your top three groups are always a click away. And when you click to filter on a group, you see the top contributors to the group at the top left. On the bottom bar of each post tab, Convofy shows you the people you are most likely to discuss the post with, that’s the top contributors on the post. On your contact list, click a user name to see their top groups, top tags, recent posts and contact info. It is the easiest way to get the skinny on what a coworker is all about. We would love to hear about the analytics based tricks that you would like to see in the future from Convofy, and about your team’s own bubble wars.